EastComfort's Romania apartments are available to rent in central locations of Bucharest. View all apartments from EastComfort and select an apartment in Bucharest by our recommendations. Living room with extensible sofa,, bedroom,kitchen and bathroom with shower. 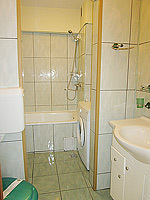 The flat is a competitive alternative to state-run Bucharest hotel and it can accomodate 4 persons. The flat has 1 double bed and an extensible sofa in the living,coffee table,TV. The apartment is endowed with cable TV set and air conditioning.The bathroom had shower and the Kitchen is fully equipped. Nestled between United Nations Square and Calea Victoriei,about 20minutes walking distance from the Unirii Shopping Center, in the heart of downtown entertainment, easily accessed toward famous stores and restaurants: KFC, Roata Restaurant or City Cafee-international bar & restaurant, Big Mammoo Restaurant.